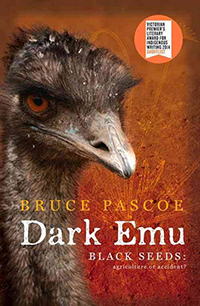 Bruce Pascoe is an extraordinary writer and he has crafted an extraordinary book. In Dark Emu he examines the history of Aboriginal relationships with the land as that history has been concocted over more than two centuries by European ‘invaders’. Bruce methodically and carefully presents the now growing evidence, resulting from thorough research, that the original inhabitants grew much of the food they ate, built permanent houses, often lived in settlements of over 1000 people, created beautifully landscaped burial grounds, created elaborate aquaculture infrastructure, cultivated and harvested grains and managed the land in a way that prevented catastrophic wildfires. The Aborigines had a larger area of land under grain cultivation than Australian farmers manage now. It extended in a wide belt from the south-west corner of the continent, up through central Western Australia, through the centre of the Northern Territory, then down through eastern South Australia, central and south-west Queensland, over all of New South Wales west of the Great Dividing Range and into two-thirds of Victoria. These huge areas of grasses and rice and the extensive yam daisy fields were deliberately destroyed by the early settlers or taken over and ruined by their sheep. Much of the evidence of the extent of the sophistication of pre-colonisation Aboriginal society and culture comes from diaries of early explorers and ‘land-grabbers’, including drawings and photos. What these newcomers needed to do was lie in their official reports about what they witnessed in order to justify their colonisation with total disregard for the lives and needs of the people who so obviously already occupied the land and had a deep spiritual connection with country. These “verdant plains” had been cultivated by the Aborigines! The book is well referenced and Bruce quotes liberally from contemporary writings. These show both the considered admiration of some (such as Sturt) and the blinkered, prejudiced attitudes of others (such as Mitchell). Bruce Pascoe also writes extensively about the relatively peaceful way in which the various family groups and clans cooperated across the entire continent, to everyone’s benefit. There was violence between individuals and groups, but no wars to gain territory or to subjugate other groups. He repeatedly shows how the Aboriginal civil-political culture, agriculture and aquaculture was ignored or destroyed by the whites and, in many cases, the people were massacred. This book, as I said of his previous history, Convincing Ground (Aboriginal Studies Press, 2007), should be part of the high school curriculum across the country and students need to be taught how the colonisers and their successors rewrote history to suit themselves. I went through high school in the early 1960s and we were taught categorically that the original inhabitants of this continent were sparsely distributed and lived entirely in poor, temporary shelters, surviving solely on hunting and gathering. Not much of the teaching has changed in the intervening fifty years. In this book, Bruce Pascoe sounds occasionally saddened and even frustrated, yet he rarely sounds angry. He urges all of us living in Australia to learn what we can from the way the Aborigines lived before 1788, so that we may adopt as much of it as could allow us to survive and even thrive, without the damage we are doing. Research repeatedly shows that the Aborigines developed the longest-surviving society on the planet and were probably the first to develop agriculture, which in turn supported a sedentary lifestyle. Colonists managed to destroy that ancient society within a number of decades of arriving, yet the little that can still be gleaned could be invaluable to the survival of Homo sapiens, at least on this continent. Bruce Pascoe points to this possibility and we would do well to listen to him.